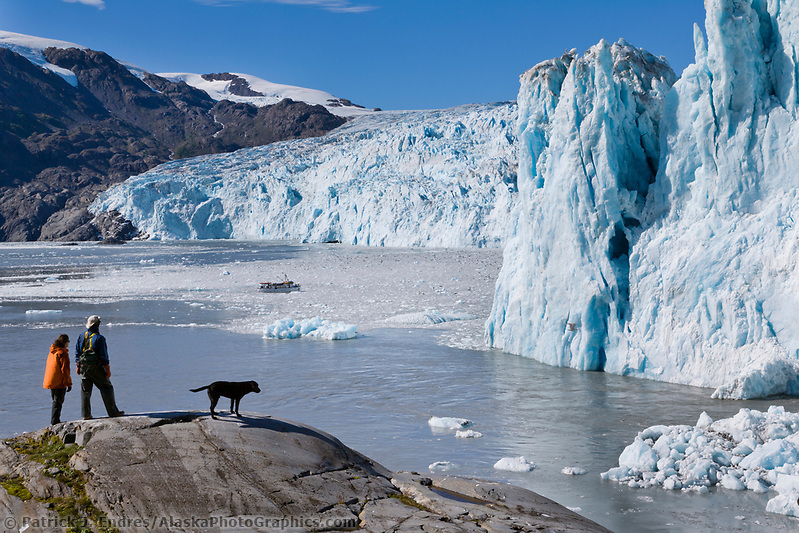 Alaska glacier photos and natural history information. Any aerial flight over Alaska’s mountainous regions will reveal long and winding rivers of ice that are remnants of a former ice age. 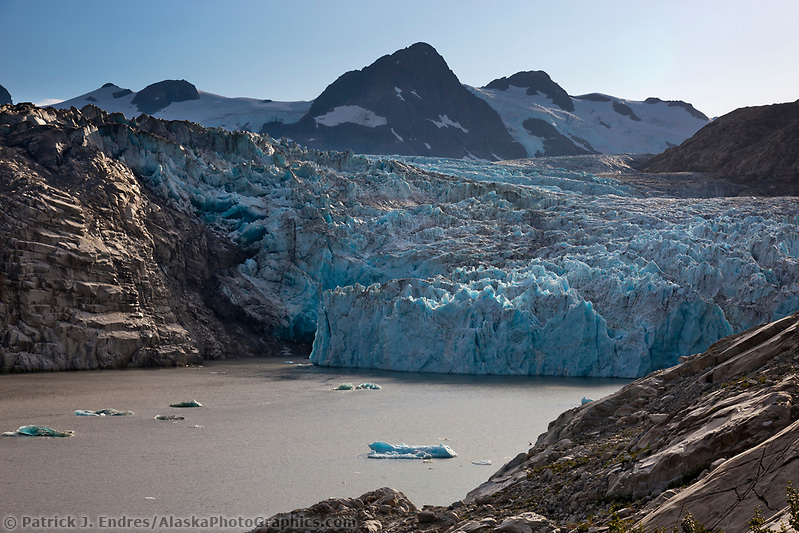 They are monstrous masses of compressed ice that have slowly, over the millennia carved and shaped the landscape.The Alaska glacier photos here are from various regions of Alaska, but primarily in Prince William Sound. All photos may be licensed as stock photography for commercial use, or purchased as fine art prints for your home or office decor. The tidewater glaciers–those that descend from the mountains and meet the sea’s edge–tumble huge chunks of blue ice into the surrounding waters. 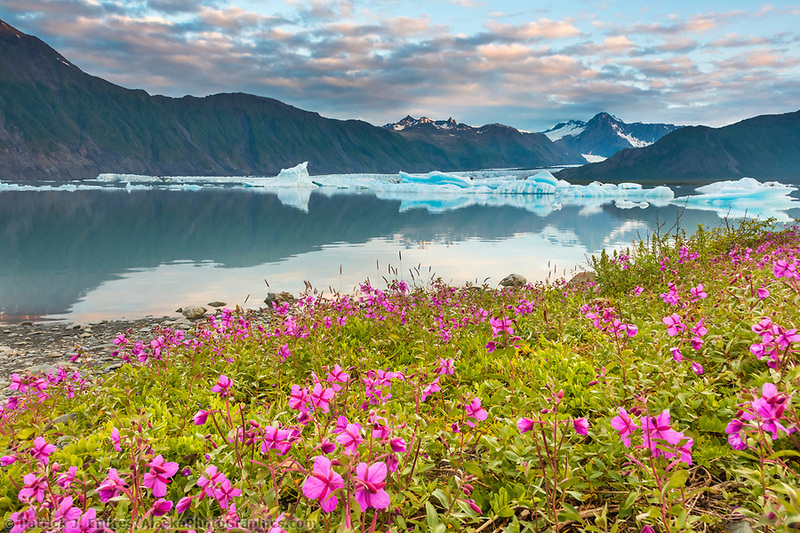 Witnessing this sight and sound is a hallmark experience of Alaska’s true wilderness. 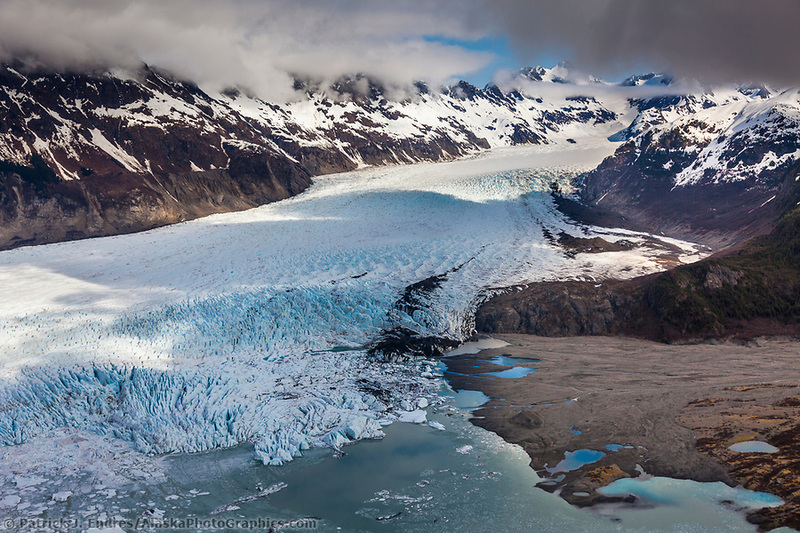 Icefields and an estimated 100,000 glaciers cover 5 percent of Alaska’s surface and they are easily viewed by visitors to Juneau, Valdez, Whittier, Seward, Anchorage, the Matanuska Valley, and other Interior locations. Glaciologists have discovered evidence of glaciation in Alaska reaching back 5 million years, and suspect the area has been glaciated for nearly 15 million years. Few other places on the planet have experienced such a prolonged period of glaciation. In cooler periods, glaciers covered all of the coastal plateaux. During warmer periods, they retreated to the mountains. About 20,000 years ago, the Earth’s climate cooled and the last of the great Pleistocene ice age glaciers advanced down from the Chugach Mountains. Glaciers formed in the stream beds of the coastal plateau and carved deep valleys. 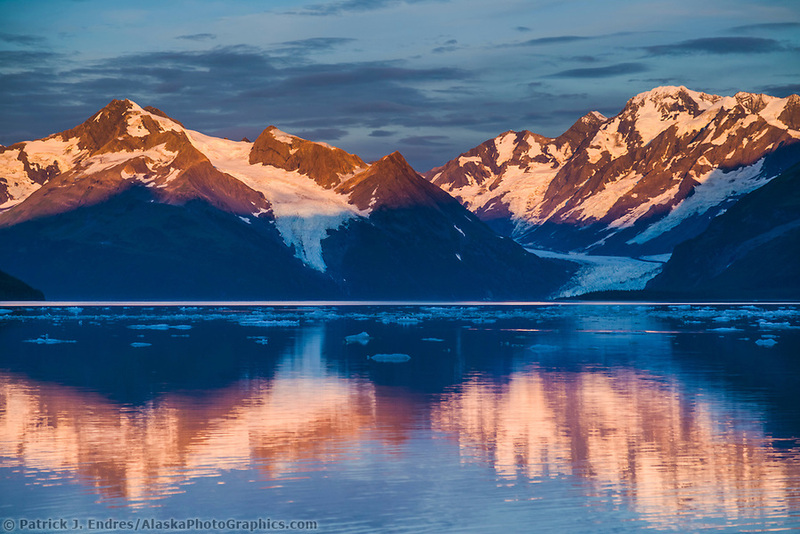 When the glaciers receded about 12,000 years ago, they had scoured the Earth’s crust down to the granite roots of the Chugach range and scoured out deep fjords (glacially carved valleys filled with sea water) creating Prince William Sound and the rugged, glacially sculpted Chugach Mountains. 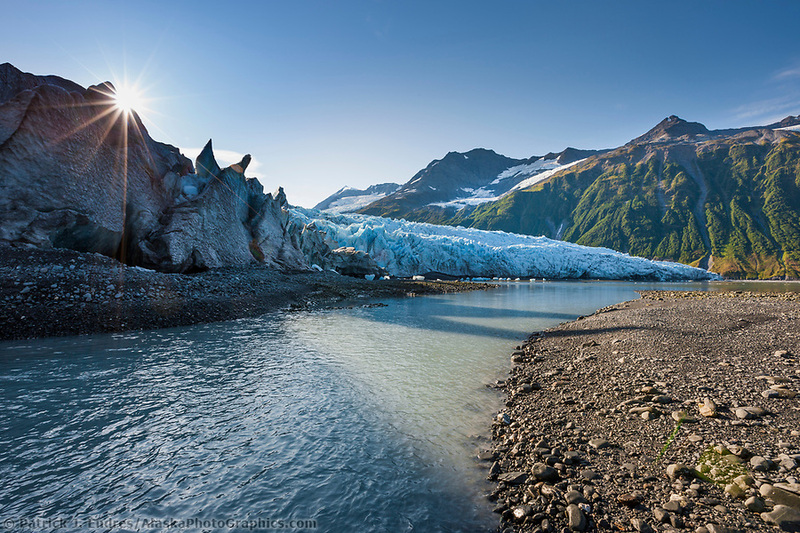 The pure-water runoff from the 27 mile-long Matanuska glacier is used for drinking for a large part of Anchorage, Alaska’s largest city, and the surrounding areas. 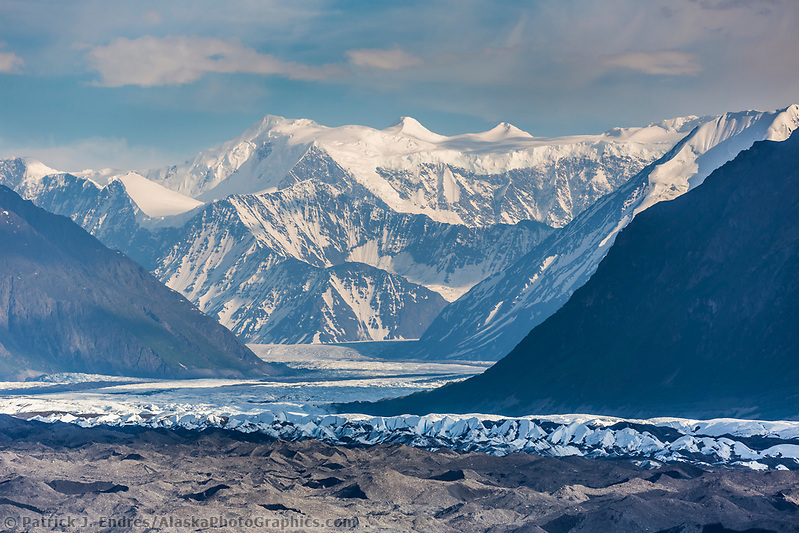 Malaspina Glacier is the largest glacier in the state, with an area of 1,500 square miles and extending 50 miles from Mount St. Elias toward the Gulf of Alaska. The climate changes facing our planet today are revealed dramatically in the shrinking, melting, and receding glaciers throughout the world. After analyzing more than 2,000 glaciers in 11 mountain ranges and three archipelagos (including 780 glaciers that have names), federal glaciologists Bruce Molnia found that only about a dozen of the large, named glaciers have advanced during the past few years. This recession trend is seen most clearly in many tidewater glaciers that no longer reach the ocean. While this trend has been happening for several centuries, it is now happening more rapidly. Prince William Sound, nestled in the coastal arc of Alaska’s Chugach Mountain Range, has more than 20 glaciers terminating at sea level; numerous others cling to precipitous mountainsides (hanging glaciers).These glaciers form because warm, low-pressure systems sweeping in off the Pacific Ocean in the winter encounter the high mountains, rise, cool and deposit their excess moisture as snow. More snow falls in the long winter than melts during the short summer. In fact, in the higher elevations of the Chugach Mountains, it is not uncommon for snow to fall twelve months of the year. 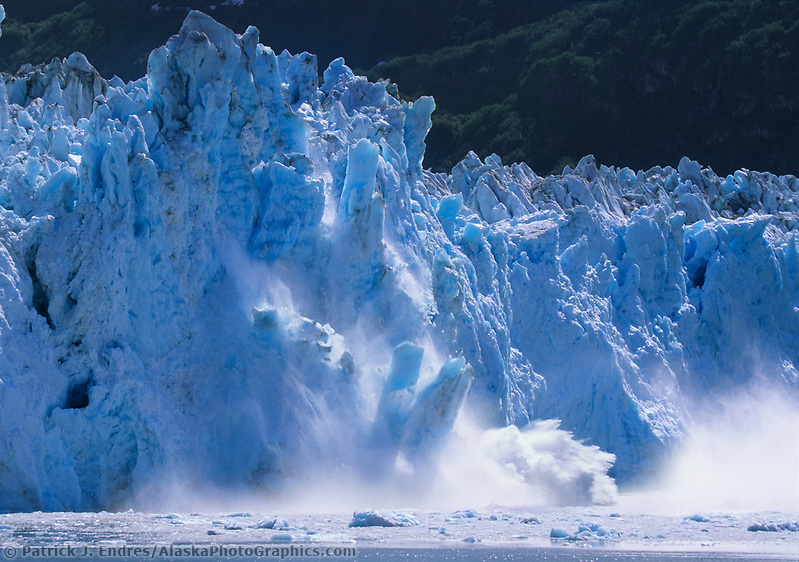 The thick, accumulating snow layers compress into ice which gradually flows down to the sea as glaciers. Snow can mask deep crevasses in glaciers. Climbers of North America’s tallest mountain, Denali, rope themselves together not just to reduce the danger of falls from steep slopes but also to reduce the risk of falling into one of the many crevasses. Tidewater glaciers: Glaciers that reach the sea. Freshwater glaciers: Glaciers that end in a lake. Valley glaciers: Glaciers that end in a valley. Hanging glaciers: Glaciers that descend part way down mountainsides. 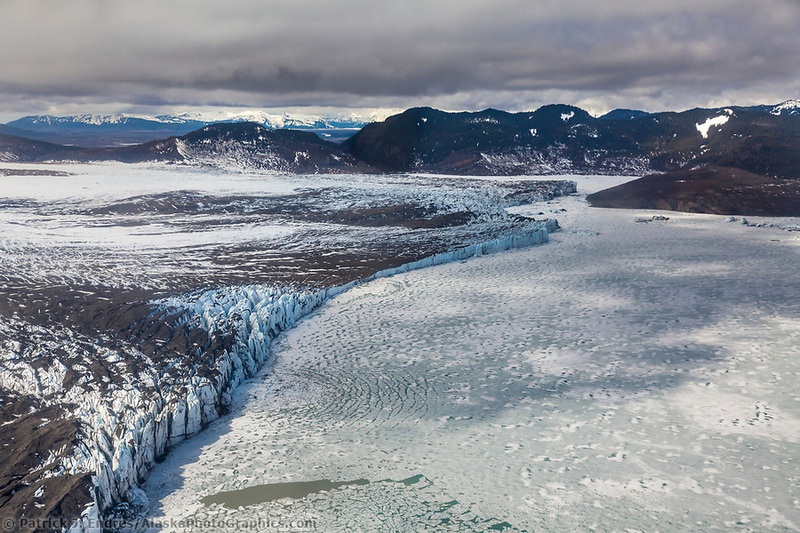 Receding glaciers: Glaciers that are melting faster than they are advancing. 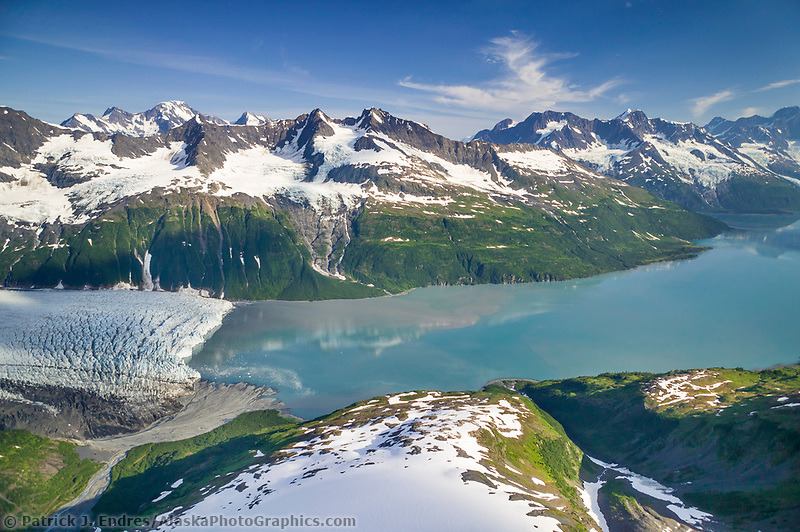 One of the glaciers in Glacier Bay National Park receded 65 miles between 1794 and 1916. Terminal Moraine: The ridge of soil that marks the furthest advance of a glacier before it began to recede. Portage Lake was formed behind the terminal moraine of Portage Glacier. 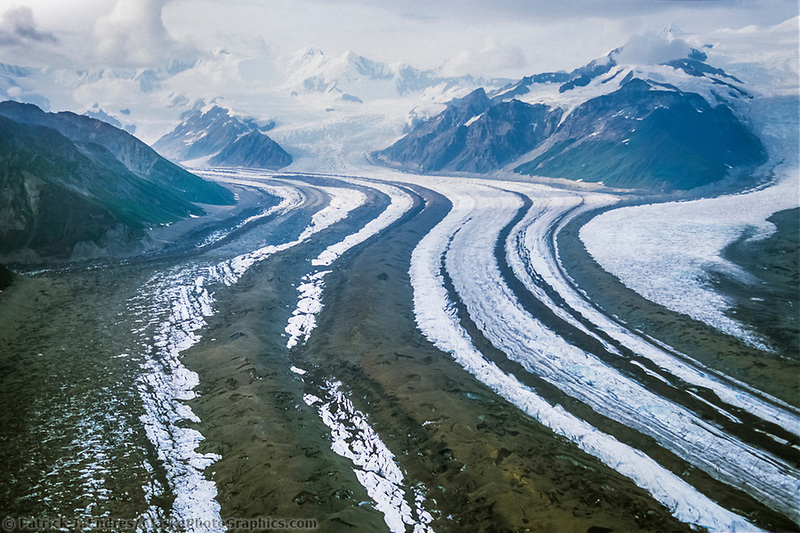 Medial moraine: Sometimes a dark stripe can be seen running down the middle of a glacier. That is pulverized rock that was pushed up between two merging glaciers. 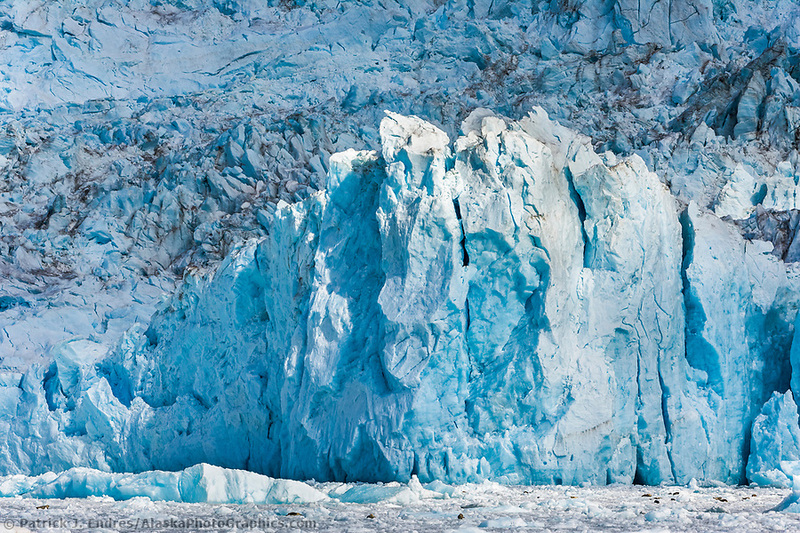 Nancy Lethcoe, An Observer’s Guide to the Glaciers of Prince William Sound, Alaska.